These two books are literally changing my life. I feel sorta awkward sharing something like this on the blog, because parenting is personal and the internet is messy -- I don’t want to be another source of frustration for anyone. But because these books are soooooooo (oooooooooooo) helpful to me I wanted to step out of a comfort zone to mention them incase they could be this helpful to someone else. As with everything I write, I’m writing with the best intentions and not throwing any secret extra judgements out with it. Just sharing what’s working for me -- and it’s ok if it’s not meant for you. The hard thing for me here in trying to review them is, they are SO good that I am almost speechless. I have a hard time knowing just what to write for you. It really just boils down to: reading these is a fantastic thing. Actually, at this point in my parenting career, if pressed, I’d say these are the only two books I’d read on parenting. I’d throw away anything on baby sleep (for sure! )(And I’m not even saying that embittered, it’s just that after three babies I no longer think there are strategies, I just think they sleep when they sleep - the end) (and again, it’s ok to disagree with me there), or anything to do with food, or just random whatevers….and just keep these. The Whole-Brain Child is a really cool book. 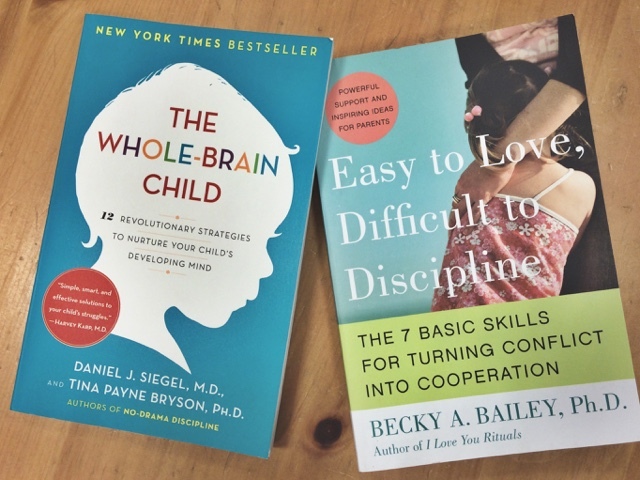 It basically takes neuroscience and psychiatry, as well as child development stages, and smashes it all into an extremely helpful, easy to follow, enjoyable read. 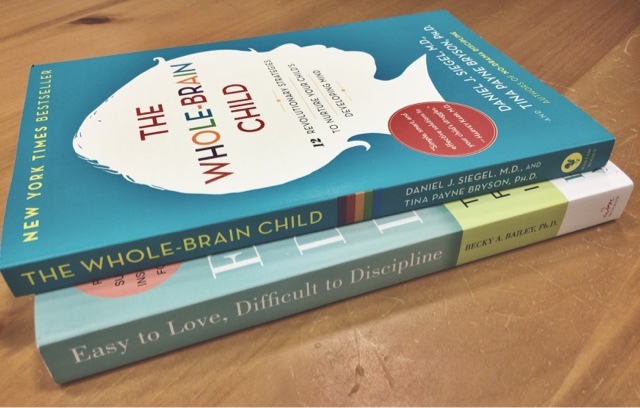 First, the book kind of breaks down the way the brain works, and how and when kids’ minds develop. I learned that initially kids minds do not have the capacity for higher function. (In hindsight while typing this I feel silly not seeing that one as obvious, but I didn’t -- it was something I needed to have pointed out to me.) What that means in life is, when a two year old is having a temper tantrum, it’s just because they don’t have the rest of their brain available to them yet, to work through that tantrum calmly. (This is all written MUCH better in the books, this is my butchered up version.) So just having that pointed out to me, was like a breath of fresh air and en enormous relief because I could see those tempter tantrum moments for what they were and come at them with grace and patience, instead of fear of failure and over-determination to force something impossible. I could just tell myself, “Their brain isn’t even there yet, it will be there later.” I’ve even been able to use that to teach my kids to understand each other better. When Ruby, my now 4 year old, is not able to accept Jasmine’s (who is 6) “No thank you” without screaming in dismay -- I’m able to remind Jasmine to not take it personally, that her mind is still growing and some day she will be able to respond different when she grows up some more. And then she is able to look at the moment with more grace and patience as well. One of my other favorite things in the book is how it it explains the way traumas enter the mind (they start on the right side as physical sensations and that swirls up emotions on the right side.) And then they go on to explain how important it is to talk about those things because when you name what you feel then it’s able to move to the left side of the brain and be filed away, and then it can stop swirling around inside your mind and rest. The books reminds parents not to avoid letting kids talk through their traumas because they need to talk about it in order to heal. That was HUGE for me to read, because when I read it my c-section was still swirling around the right side of my mind. And then I was able to grasp why, so I no longer felt so guilty about it, and then I was able to submit to the process of healing properly. It’s also been super cool to use in parenting. When kids are young you can do this (the book calls it “name it to tame it”) for them. My middle child benefits enormously from this kind of help. When she falls down and gets hurt (because I read this book) I am able to go up to her, pick her up and verbalize her pain. I will say “You fell down, and you scraped your knee and your knee hurts.” (She will tearfully agree, or correct me if it’s some place else that hurts.) I then will say a couple more times something like “It’ hurts. It hurts really bad.” I will say her feelings for her until she seems to calm down a bit. Then I will maybe add something like “and you are so sad." You should know, that when no one does that for her, she will scream indefinitely -- and I do mean indefinitely -- her feelings and will are a force to be reckoned with. It does feel rather like magic. The book has a lot more in there than that. And to be honest with you, I’ve yet to finish it. I’ve owned it for about three years, and I haven’t finished it. And it’s not because it’s boring, it’s because I keep re-reading the parts I’ve already read, and pausing to let it soak in deeper. I am certain I will read it all. And I kinda thought I should wait to write this blog post until I did. But then so many people could miss out -- because I’m clearly in no rush. But yes, this book comes highly recommended by me, even while still in the middle of it. Easy to Love, Difficult to Discipline is blowing my mind. And I don’t say that lightly. I actually mean it’s just blowing my mind to smithereens. In the best way my mind could ever be blown to bits. The title is kinda misleading. 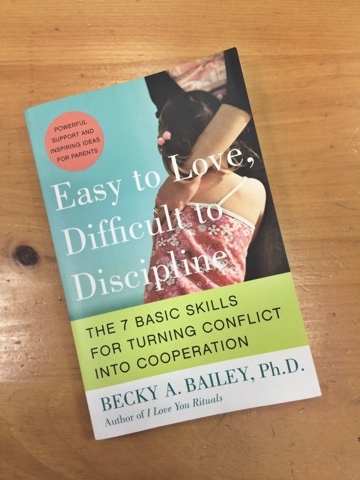 I don’t think of this book as a discipline book but more like a guide to interaction. I don’t quite know how I got past the title to actually read this book, except for I’m one of those people who kinda of just clears entire library shelves all at once when interested in something. This book just happened to be next to some other book I thought I’d like to read and so this one came home with me when I dumped the whole shelf in my bag. And it turned out to be SO amazing…and I can’t remember the other book which lead me to it. ha. I have an even harder time describing this book. In my case it’s basically like a re-programming my own brain book. And in so doing it’s greatly benefiting my parenting skills. Not to mention my whole life outlook. The first one is, the author spends a great deal of time, and spreads the concept throughout the book, denoting the difference between acting out of fear or acting out of love. I personally struggle with a lot of fear. So this is a big deal to me. And when she points these things out, she does so in a very concrete examples. Which is exactly what I need. It’s very clear instructions. One way she does this is, she will run through different scenarios and describe a fear based response to it, and a love based response to it. And then she will give very clear instructions on how to handle teaching children from a loving place not a fear-driven place. It’s some of the most clear instructions I’ve ever come across in general, but even better they are super sound and good. And since I’ve starting going to counseling this book has become even more amazing to me how clearly she is able to convey a bunch of stuff I’m learning there -- so I feel like I’m double checking my facts and finding them very good. My other favorite thing that I will mention is: This book taught me how to get my kids to get along. Over this summer I’ve received a lot of compliments where people who basically say, “Wow your kids don’t fight.” And I will respond with “They do, I just taught them how to do it well.” And then they pretty much universally tilt there head (very far) and furrow their brow. Some would ask more, some would brush me off in confusion. But either way, I got a clear impression this isn’t a standard thing to do. This book taught me that usually kids are not disobeying, or doing the wrong thing, because they want to, but because they lack the skills to do otherwise. So when you give them lessons in the skills they need, their behavior improves dramatically. Therefore, when my kids disagree about something, I teach them the healthy way to voice their opinions, discuss their options, and come to an agreement. Since I’ve spread my reading of this book out so far, I can’t remember if the book gave me exact instructions on this, but I know it gave me enough information in order for me to do this. This book made it really clear to me that since kids don’t have the knowledge do many things yet especially share smoothly, I need to give them exact words to say to each other when the interactions occur. This includes how to express hurt feelings in a healthy manner. I want my kids to be empowered enough to believe their feelings matter. So I teach them to say them, so the other person can acknowledge them. And this applies to both sides. Lets say a doll gets taken away from one girl without asking. I will make everyone pause and we will talk it out. A lot of times the other child will response naturally on her own to say she is sorry and give the doll back just because she hear how the other feels. But sometimes that child is so into her own thoughts still she is still wanting to have it anyway. Not every time. Sometimes hard crying follows that answer. Which makes sense. And we continue coaching from there, or just let that person get some time to work through their feelings. But the cool thing is, after we practice this enough times, my kids are more and more able to do this without coaching. So when adults witness these conversations happening without me giving them help, that’s when I get the comments about how my kids don’t fight. They do fight -- they just learned how to do it well. And to be clear, I’m not saying we are perfect. And there are definitely days still where I coach through more fights than I knew could possibly ever happen. And by the end of that day I don’t feel like doing it anymore, and sometimes I just can’t. And some days as soon as Blake is in the door I go hide in another room for my sanity sake. But what I’m excited about is, that’s not every day. And it’s not even most days, just some days. The cool thing really is that there is clearly a marked improvement in our family’s functionality because of this book. But like I said before, this book is jam packed with goodness. I hope everyone who interacts with children at all, gets a chance to read it. And honestly, it’s so good it could be helpful even if you don’t interact with children. It just really covers some good emotional ground. I couldn’t recommend it any stronger if I tried. I’m not overstating it when I say that I will think I will re-read this immediately once I finish and then again and again over many years. It is such a blessing to my brain patterns I want to seal it in really, really well. So my advice is go get these two books. If you are pregnant, just had a baby, have kids (who are probably about junior high and younger (probably older too)) or you interact with children (or even just people in general) -- this information can only benefit you. The sooner you read these the better you can implement them. My library has them. I started by checking them out. But I soon bought my own cheap off of amazon because I knew I needed to own them. So that’s what I’m doing at night lately (if I’m not too busy with the random house projects and life in general) I’m reading, and re-reading, these pages, and soaking it in. So I hope this post inspires you to look into these, and that they help you out as much as they are helping me. 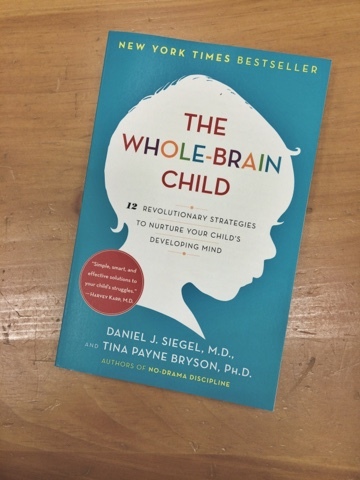 Almost all the parents I know have been recommending the whole-brain child I really need to get reading it! The other book sounds really good too. My kids could do with some coaching on how to disagree well. With Car Rental 8 you can find the most affordable car rental from over 50000 locations across the globe.